Baseball America over the weekend released Mock Draft 3.5. Why 3.5 rather than 4.0 I don't know. But they kept Kyle Wright, Vanderbilt right hander, as the first overall selection, as "the best combination of upside and modest risk." It's the first time they haven't had a different first pick for the Twins. I’ve heard that the Twins are in on at least four players at No. 1, including Brendan McKay (as a bat or a two-way guy but not just as a pitcher), Mackenzie Gore and Hunter Greene, but the current betting in the industry is that they will take Wright as the prospect with the best combination of floor and ceiling. The Twins have a plan to use the extra money on later picks. That approach certainly worked for Houston when the Astros took Carlos Correa 1-1 over Byron Buxton. Nick Tepesch, who had one brief start with the major league club in early May, went on the Triple A disabled list with "elbow impingement." With an ERA at Rochester of 5.59 -- which if anything understates how poor his results have been (six homers in 29 innings) -- it's not like he was on the verge of coming back up, but it's another reason to expect the Twins to leave Kyle Gibson and Adalberto Mejia in the rotation for a while. Glen Perkins threw to hitters on Tuesday at Target Field. He threw 23 pitches, all fastballs. Chris Gimenez, one of the hitters to face him, said the velocity was in the mid 80s but saw good movement. Perkins now returns to Fort Myers to continue his rehab. According to the Mike Berardino piece linked to above, the plan calls for a few more live BP sessions at extended spring training followed by a rehab assignment with the Class A Miracle. That sounds like a timeline for a late July return if everything works perfectly. It's not truly accurate to blame Monday's bullpen disaster on Sunday's 15-inning marathon. Imagine for a moment that Brandon Kintzler hadn't coughed up the lead Sunday and the Twins had won in nine innings. On Monday Paul Molitor would still have had the same problem: His three most trusted relief arms -- Kintzler, Taylor Rogers and Tyler Duffey -- had been worked hard. Duffey threw two innings Saturday and really shouldn't have been used Sunday but was, and Rogers and Kintzler each pitched Saturday and Sunday. Molitor's choice underlines the lack of bullpen depth. Rogers and Kintzler aren't the prototype late-inning arms, but they've been pretty effective. The problem is, two late inning arms and one multi-inning middle man -- which is what Duffey has been -- worked for Earl Weaver some 30 years ago, but it's not enough in the modern bullpen. 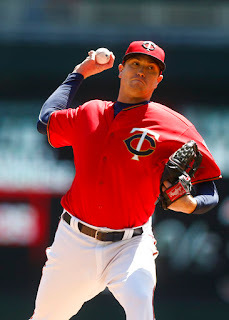 The Twins have aggressively shuffled their bullpen, and that continued after Sunday's game, with Rucinski returned to Rochester and Buddy Boshers recalled. But it continues to be a parade of low-impact arms. The power arms that might made a difference are awaiting surgery (Nick Burdi), recouping from injury (J.T. Chargois, Tyler Jay, Jake Reed) or simply deemed not ready for the majors (Mason Melotakis and John Curtiss). The roster moves are just swapping out one minor-league free agent for another. I know this: The relief pitchers we saw Monday aren't the answer. We had a little news judgment debate Saturday at the Free Press: Whose death was more significant, Jim Bunning's or Gregg Allman? The majority thought Allman; I decided that the Hall of Fame and 24 years in Congress outweighed "Whipping Post" and a comically short tabloid marriage. I got both obits in, but I played Bunning's higher. Not that I ever wholeheartedly embraced Bunning's HOF status. His record, in my view, is good but not outstanding: 224-184, 3.27. Not that it's a binary choice, but I'd go with Luis Tiant (229-172, 3.30) over Bunning. Bill James had a more favorable view of Bunning's record in some of his books, however. Bunning did have a perfect game (1964, against the Mets; one is tempted to put an asterisk by it because it was the Mets, but even the Mets didn't get no-hit daily), and he did play a key role in one of the most storied collapses in pennant race history (pitching, and failing, repeatedly on short rest down the stretch as the Phillies blew a 6.5 game lead in the final 10 days in 1964), and he did play a key role in the hiring of Marvin Miller to head the players union. The Hall of Fame's on-line bio of Bunning lists his primary team as Detroit, and he did play more for the Tigers than anybody else, but his plaque depicts him in a Phillies cap, which is more correct. There are four HOF pitchers with significant ties to the Phillies (none spent their entire careers there): Grover Cleveland Alexander, Steve Carlton, Robin Roberts and Bunning. Bunning is clearly the least of them, which is not an insult. In Congress -- 12 years in the House, 12 in the Senate -- well, I follow politics fairly closely, and I can't remember any particular issue on which Bunning was a key figure. Time in 2009 named him one of the five worst senators, which isn't necessarily conclusive but something most officeholders would prefer to avoid. A move right out of the Earl Weaver guide to making umpires hate you. We really don't see many theatrical manager arguments anymore, in large part because of replay. I don't think I miss them much. Adalberto Mejia was indeed called up after Friday's game to make today's start. Adam Wilk, the lefty claimed off waivers from the Mets on May 10, was designated for assignment. Wilk made two long relief appearances in some 16 days on the roster, working seven innings total. It was relatively easy to forget that he was on the roster, and I suspect that he's one of those guys who, when I look at the Baseball Reference page for this team five years from now, I'll think: Who was that? Maybe he'll clear waivers and accept an outright to Rochester. Maybe he'll be claimed. I doubt anybody in the front office is overly concerned either way. A worse loss for the Twins was announced Friday: Nick Burdi needs Tommy John surgery. I saw his second professional game, working for Cedar Rapids in a game in Clinton, Iowa in July 2014, and wrote about him (and Kohl Stewart) here. I am fairly certain that if on that muggy, buggy night I were told that the major league team would be in first place entering Memorial Day weekend in 2017, I would have expected that one or both of those pitchers would be part of that. But Burdi, who was overwhelming the Southern League this year, can't seem to stay healthy, and Stewart is struggling in Double A (22 walks in 24 innings). Anyway: scratch Burdi for 2017 and probably 2018, at least in terms of getting to Target Field. He was supposed to be a fast mover, but ... pitching at around 100 mph is a cruel occupation. Phil Hughes is seeking a second opinion on his arm issues. Glen Perkins is apparently going to pitch to hitters (what they call live batting practice) on Tuesday. My lukewarm takes: Hughes isn't so sure his current issues aren't related to the thoratic outlet syndrome for which he had surgery last year. And I'm glad to see some progress for Perkins, but I'm not counting on him for 2017. The Twins had an off-day Thursday. They have played 43 games so far; their opponent this weekend, the Tampa Bay Rays, have played 50. Nobody in baseball has played fewer games than the Twins to date. The relative lack of games allowed manager Paul Molitor to sharply narrow his starting rotation this month. Ervin Santana, Hector Santiago and Phil Hughes have made every scheduled start (although Hughes went on the disabled list after his last start). Molitor has skipped a rotation spot at every opportunity and shuffled Jose Berrios (three starts this month), Kyle Gibson (two starts), Nick Tepesch (one start) and Aldberto Mejia (one start) in and out of the rotation and on and off the roster. That approach is not going to work forever. The Twins have a shortfall of games played to make up in the remaining four months or so of the season, and the opportunities to skip a rotation spot will disappear. Santana, Santiago and Berrios are the current givens in the rotation. Gibson is the current fourth, and while his leash is perceived to be short it's not obvious who will dislodge him. Sunday's starter has not, to my knowledge, been identified, but I expect it will be Mejia, which will require a roster move of some sort after Saturday's game. Ervin Santana has made 10 starts this season, going 7-2 with a 1.80 ERA. Wins are an exceptionally noisy stat, but he had seven wins total in each of his first two seasons with the Twins -- and now seven before the end of May. More significant is the ERA, which is about 2.2 runs per nine innings below his career figure. He's getting these results even though both his walks per nine innings and his strikeouts per nine innings have not only deteriorated from last season but are approaching career worsts. According to Baseball Reference, Santana's FIP -- Fielding Independent Pitching, an attempt to determine what his ERA would be with an average fielding team supporting him -- is 4.10, which is pretty much in line with his career figure (4.22). The 2017 Twins have been a better than average fielding team, but I doubt that everybody's getting two runs per nine innings of benefit. Well, let's check it out. Hector Santiago and Phil Hughes are the next highest pitchers on the staff in starts (nine apiece) and innings (50 for Santiago, 47 for Hughes). Santiago has a 3.96 ERA and a 4.85 FIP -- a significant difference, but less than half what Santana is getting. Hughes, now on the disabled list, is the opposite -- his actual ERA, 5.74, is about a half run worse than his FIP, 5.29. Small sample sizes are inherently noisy, and there are some subtle differences in the 2017 Santana -- a bit more movement on his pitches, a wider velocity differentation between his slider and changeup. His ERA in his final 18 starts of 2016 was 2.41, so we're really seeing a much longer run of markedly good results. My expectation is that Santana's walk and strikeout rates will improve, which should lower his FIP. I also expect that his ERA will rise. Thirty-one hits allowed in 70 innings? That is not sustainable. Jorge Polanco played regularly at shortstop the last two months of 2016. He played the position like a pinball bumper -- 11 errors in 406 innings -- which essentially fit his erratic results in the minors. And yet Paul Molitor persisted. He saw a major league shortstop in Polanco where almost nobody else did. And so far this season he has been vindicated. On Tuesday John Dewan, founder of Baseball Info Systems, posted this piece on the Twins fielding improvement this year. After a rough start to his defensive career as a rookie in 2016, Jorge Polanco has been looking very comfortable at shortstop so far this season, saving the team five runs. In particular, Polanco has shined with his throwing arm, making seven plays above average in the hole between shortstop and third base. As if to underline that second sentence, Polanco made two such plays in the ninth inning Tuesday night in the Twins shutout win over Baltimore. Polanco has not hit quite as well as I expected (which doesn't mean he won't). He has been far better afield than I could have imagined. When you look for reasons the Twins are so much better this year compared to last, Polanco the shortstop is high on the list. That's the optimistic take, and it assumes not only that Berrios is suddenly a solid major league starter but that none of the Santana-Santiago-Berrios-Hughes combo gets hurt. That's ... unlikely. Berrios was even better the second time out. But Hughes has since spluttered and gone on the disabled list. 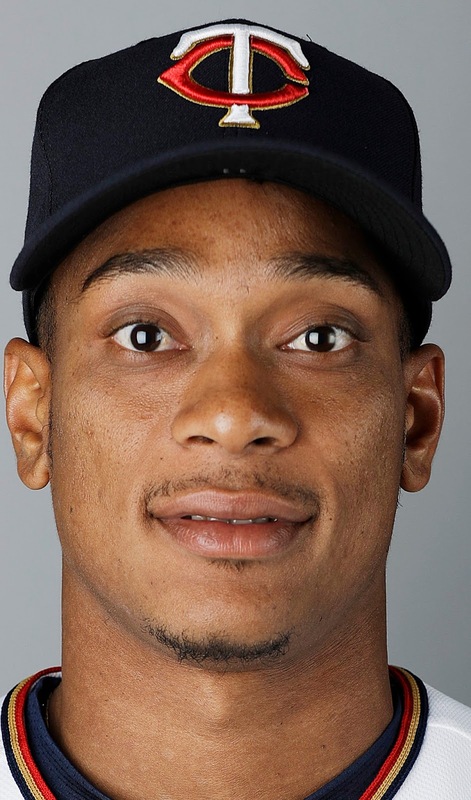 Aldaberto Mejia, who opened the season as the fifth starter but didn't fare well with inconsistent work, returned for the second game of Sunday's doubleheader and got the job done: Seven innings, three runs. Do that every start, you're gonna make a lot of money, kid. He was immediately shipped back out as the Twns gamed their roster, but he figures to be back real soon. Kyle Gibson started Monday and was SOG -- Same Old Gibson. He managed to both worsen a horrid ERA on the season (from 8.20 to 8.62) and get the credit for the win. Twelve runs of support can cover a multitude of sins, and Gibson had a multitude to cover. Eighty-six pitches and just 48 for strikes? 415 pitchers have 500+ innings since 2000 and Kyle Gibson (38%) is the only one to throw fewer than 40% of his pitches in the strike zone. Santana-Santiago-Berrios does not add up to a five-man rotation. I'm not sure at this point that inserting Gibson brings them to four, but that appears to be the short-term intent for lack of a better idea. Asked Molitor whether Kyle Gibson gets another start. "We don't have a lot of options right now. He's on the roster," & no moves planned. We don't know how badly Hughes is injured or even what the injury is. No matter what, he's out of the picture for at least eight more days. Presumably Mejia will get called up again for Saturday's start, although it's possible that they might try to get through with a bullpen game if they don't have to take innings from Adam Wilk and Justin Haley between now and then. If couse, if they do that, the 'pen is vulnerable going into another Gibson start on Sunday. We're gonna see a lot of roster juggling this summer. Readers with a particularly good retention of what shows up here might remember that last September my wife and I went to Cedar Rapids to see the Kernels and I came home with a Michael Cederoth jersey. Confirmed: The #MNTwins have released minor leaguers AJ Murray (Catcher) and Michael Cederoth (RHP). Cederoth, according to Baseball Reference, hadn't appeared in a game at any level this year, and he totaled just 128 innings in his minor league career, none higher than low-A ball. Presumably his career ran aground on injury. The Twins invested a number of early draft picks in his class on college relievers: Nick Burdi in the second round, Cederoth in the third, Sam Clay in the fourth, Jake Reed in the fifth, John Curtiss in the sixth. The other four remain in the organization. None have made the majors yet, but Burdi and Curtiss have combined for 39 strikeouts and just one earned run allowed in their 30 innings in Double A. They might make it someday. It may be premature to declare that Cederoth won't, but getting released certainly doesn't help his cause. I don't often wear jerseys, but I wore my Cederoth one Saturday in tribute to a career that never really got going. Good fortune be with him the rest of his way. on strikes during the ninth inning Thursday at Wrigley Field. 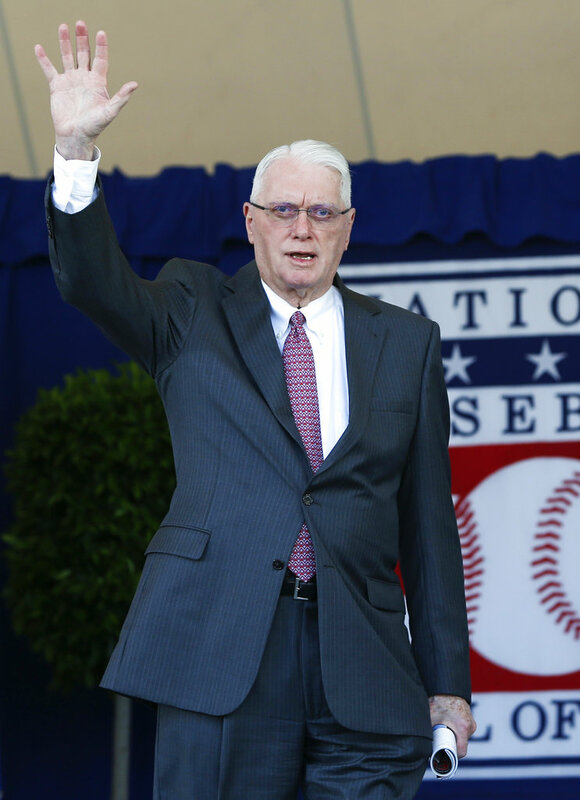 Keith Olbermann used to say it on SportsCenter: "A good craftsman never blames his tools." Suarez, this at-bat aside, is actually having a pretty solid season so far. 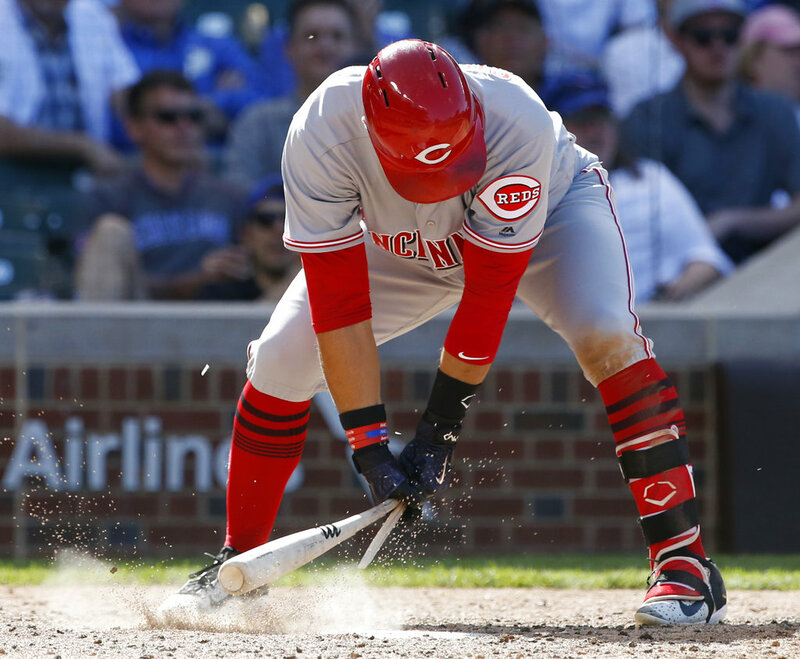 His strike zone command has improved each season with the Reds, and he's still only 25, so there's a bit more room to grow. The Kansas City Royals won the World Series in 1985. They (or more precisely, their fans) then endured almost 30 years without a playoff appearance until 2014, when they lost the World Series in seven games. They they won the Series in 2015. We're still more than a week from the spot in the calendar when I allow myself to pay attention to the standings, but the 2017 Royals are in last place. What's more, they deserve to be. The Twins' Byron Buxton has hit fairly well in May, but his overall numbers on the season are still awful: he has an OPS of .538. The Royals lineup Friday night had four players with worse OPSes than that. To be fair, two of them (Jorge Soler and Cheslor Cuthbert -- and isn't that a name out of a P.J. Wodehouse farce?) have have just over 100 plate appearances between them. But Alex Gordon (.489) and Alcides Escobar (.438) are foundation players for the Royals. And for that matter, Soler's lack of playing time is because of injury. Only Cuthbert was supposed to be a bench guy. The Royals bullpen has gone in two years from a marked strength to a weakness, certainly, and that's been remarked upon before. But the hitting, never all that strong even when things were going well, is just as big a problem. It got ugly again in a hurry in K.C. A few more mock drafts came across my view Thursday. Baseball America's John Manuel unveiled his third mock, and once again had a different 1-1. This time it was Kyle Wright, right handed pitcher from Vanderbilt. In his first, it was high school right-hander Hunter Greene; in the second, Brendan McKay, a two-way star from Louisville. Minnesota appears to be leaning toward McKay, but considering him as much now as a hitter as on the mound. Some evaluators agree that McKay has more looseness at the plate than he does on the mound, and may have more upside as a hitter, but that he’s a safer bet on the mound. However, the best combination of upside and modest risk is Vanderbilt righthander Kyle Wright, who is the third player on the Twins’ list in addition to McKay and Greene. The Twins have been in hard on Wright’s last three starts, and in his last five, he’s struck out 51 and walks seven in 39.1 innings while posting a 1.14 ERA. He’s showing up to four plus pitches at times and trending toward being the No. 1 overall pick, as long as the price is right. Aaron Fitt, once a colleague of Manuel's at Baseball America and now with D1baseball.com, posted his own mock Thursday, and while most of it is for subscribers. he also has Wright as the Twins likely pick. Two other mocks, from John Sickles of minorleagueball.com and Jay Jaffe of Sports Illustrated, had McKay going to the Twins, but without specifying a position (first base or pitcher). To repeat what I said the other day: I'd be a fool to say I know more about these prospects than the Twins do. This is a high-stakes pick, and the Twins have to balance upside with risk, and they are doing their research. The Twins know everything I know about these guys, and a great deal more. I am underinformed. One piece of information to consider is that McKay's reported velocity has fallen off in recent starts, and he's taken to throwing a cutter that is apparently relatively new to his arsenal of pitches. I feel pretty confident in this opinion: If the Twins take McKay, it should be as a hitter, not as a pitcher. All of which suggests that when you hear that the Twins pitching has improved, you should mentally that statement to the Twins run prevention has improved. The credit belongs to the fielders. No link, no indication of source. Noteworthy, however, for the identification of McKay not as a pitcher but as a first baseman. Michael Tonkin passed through waivers Saturday, indicating that (unlike Danny Santana) nobody thought him worth a roster spot, and has been reassigned to Triple A Rochester. So he remains in the organization. Normally retaining a player is better than losing him, but I fear that Tonkin's availability might result in him getting another opportunity over one of the younger relief prospects. Engelb Vielma and Nick Gordon had been splitting time at shortstop and second base with each other at Double A Chattanooga. Indeed, as of this morning the Lookouts team page at Baseball Reference had each with 19 games at short and 14 at second, an even split. But Vielma has been moved up to Triple A after slashing ,286/.362/.328 for Jake Mauer's team. Gordon (.317.,380/.472) remains in Chatanooga. This presumably opens the door for each to revert to his usual shortstop position, probably more so for Gordon than Vielma. In all of American League history dating back to 1901, more games have now been played with the Designated Hitter Rule than without it. The AL inflicted the DH rule on itself in 1973 (as my verb choice implies, I'm not a fan), so there are still fewer seasons with it than without, but the seasons are longer now than for most of the time pre-DH and there are more AL teams than pre-DH, so there are more games per year. Last summer the Twins disposed of Ricky Nolasco, who over three seasons and 56 starts wth Minnesota had pitched to a 5.44 ERA, His FIP -- Fielding Independent Pitching -- wasn't nearly that bad, but that had been true of Nolasco at his previous teams as well. toss in Alex Meyer, once a top prospect. Neither requirement was anything close to a deal breaker. We Twins fans are pretty familiar (and pleased) with Santiago's 2017 season. He got shelled Sunday in Cleveland, but even that debacle leaves the lefty 4-2 with a 3.80 ERA. His career ERA is 3.84, so Santiago this year has been pretty much what he was in Chicago and Anaheim: a six-inning lefty who walks a few more than you'd really like. Nolasco, meanwhile, got the Opening Day start for the Angels and is now 2-2 with a 4.34 ERA. His strikeout rate is noticably higher so far than is typical for him, and for once he;s outperforming his FIP. He's also given up 13 homers in 45.2 innings, which is ... a lot. Nolasco has long been a confounding pitcher, and this continues. He certainly hasn't cemented himself in the Anaheim rotation, but it appears he's getting a legitimate opportunity to see if he can find a way to use his impressive stuff effectively in the majors. A pretty good weekend for the Twins. They took a series in Cleveland and may have found another rotation piece in Jose Berrios. Berrios's strong outing Saturday was not flawless, but he looked like the pitcher Twins fans have been anticipating for a few years. Of course, for those of use inclined to see the glass half-empty, that was followed by a poor outing by Hector Santiago, whose ERA rose more than a run Sunday. I'll view that as an aberration until he shows otherwise. Friday is the night college aces come out to pitch, and Louisville's Brendan McKay, the two-way star often projected as the Twins pick as the first overall in next month's draft, had an intriguing matchup versus Clemson and slugger Seth Beer (who may be the best hitter in college ball but is not eligible for this year's draft). To the Twins fans nervous about my McKay tweets: he doesn't have his best stuff today. It happens. His full body of work is very impressive. Meanwhile, Kyle Wright, a right-handed pitcher from Vanderbilt, has propelled himself into 1-1 speculation with McKay and Hunter Greene. He threw seven scoreless innings against Arkansas on Friday. Wright has more velocity than McKay but is not (probably) as polished as the lefty. He's also probably a safer selection than the high schooler Greene. I think it's quite likely that if the Twins take McKay 1-1, it will be as a first baseman. But I can see any of the three being taken in four outcomes: Greene, McKay as a hitter, McKay as a pitcher, or Wright. And I certainly won't pretend that I know more about the choices than the Twins scouting department does. This just in: Mookie Betts is a helluva baseball player. The Twins made the Jose Berrios callup official after Friday's game and optioned Nick Tepesch back to Triple A.
Tepesch was called up April 25. He sat around until May 6 -- 11 days if I count correctly -- started, didn't get out of the second inning, and hasn't pitched since. Three weeks, roughly speaking, on the active roster with one appearance. We'll see how long Adam Wilk sits around now. So ... Berrios starts today. Presumably Hector Santiago starts Sunday, then the Twins are off Monday, and that give Phil Hughes four days of rest going into Tuesday. Ervin Santana Wednesday, Berrios Thursday, Santiago Friday ... so the Twins will need a fifth starter a week from today. If I had to guess who that will be, I'll predict Kyle Gibson, mainly because I expect the Twins want him back sooner rather than later. That comes with no guarantee, however. Earlier Thursday, in my biweekly chat with Jim Gullickson on KMSU, I explained why the Twins were going slow on promoting Berrios. I mentioned the service time issue, but emphasized the fastball command question. I'm not sure those concerns have gone away. But ... Berrios has racked up a 1.13 ERA in six starts this season for Rochester. He has 36 Triple A starts in his career and a 2.51 ERA at that level. International League hitters clearly aren't teaching him anything. And the Twins certainly have holes in the back end of their rotation. I hope he's ready this time. shuffled one marginal pitcher off the active roster to add another. 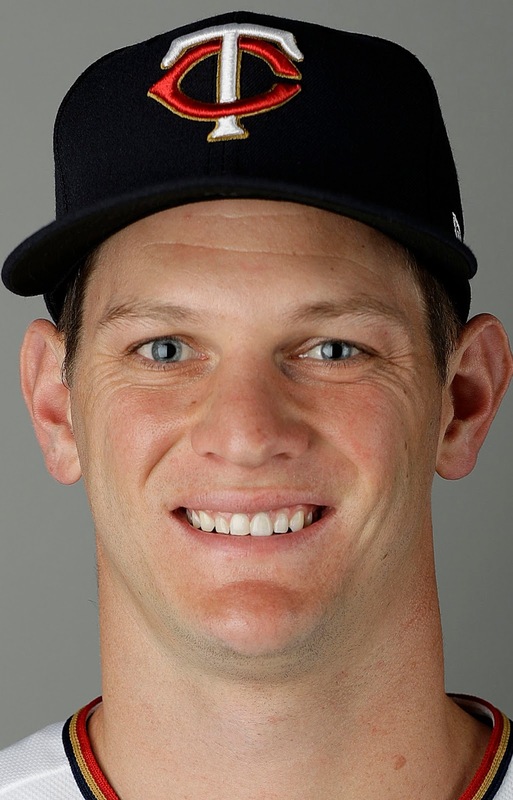 Incoming is Adam Wilk, a left-handed pitcher claimed off waivers from the Mets. He's 29 and has picked up 30 major league innings since 2011 with an ERA of 7.20. The Twins optioned out Drew Rucinski, gone after one relief outing in which he at least ate up a few innings. Neither Wilk nor Rucinski can play a significant role on a competent pitching staff. They're just filler. The 40-man roster is full again. While I would rather it be filled with a pitcher of promise, it won't be difficult for the Twins to carve room for one when one is deemed ready for the test. Ryan Pressly, expected to be the primary setup man and closer in waiting, has an 8.74 ERA in 11.1 innings. Matt Belisle, the journeyman veteran who essentially inherited that role whe Pressley started throwing home runs with regularity, sports an even worse mark (9.00) after Sunday's debacle. There is a difference. Belisle has had two horrid outings -- 11 of the 13 earned runs charged against him this season came in two appearances. The rest of the time, he's been pretty good. Pressly has had just one outing in which he got more than two outs without being charged with a run. He's been consistently ineffective. And, of course, Michael Tonkin has been designated for assignment already. We're still waiting on the power arms to come up. The question is, how rapidly are Falvine willing to push them up the ladder. Consider Nick Burdi, for example. He threw all of three innings last season. So far he's been dominating Southern League hitters (0.77 ERA with 15 strikeouts in 11.2 innings). High-end gas to be sure. But he hasn't pitched in Triple A yet, and he might be better served with a go-slow approach. Ditto Mason Melotakis, also at Chattanooga and sporting a neat 0.00 ERA for Jake Mauer. The lefty has allowed just seven baserunners in his first 13.2 innings. But like Burdi, he had limited work last season and hasn't seen Triple A. The guy I expected/hoped to see on the major league roster coming out of camp. J.T. Chargois, has pitched all of 2.2 innings this season and is about to start a rehab assignment as he returns from an injury. He won't be up soon. Jake Reed, another relief prospect who has caught eyes in the past, has yet to appear in a minor league game. All of which suggests that Pressly and Belisle will get more opportunities to work out of their problems. The Twins on Monday traded Danny Santana to the Atlanta Braves for left-handed reliever Kevin Chapman. Chapman has pitched 55 major league innings the past four seasons, all with Houston, but he wasn't on the Braves 40-man roster and had a pretty ugly ERA with their Triple A club (7.71 in 11.2 innings). He's minor league depth right now, but the Twins have been pretty active even with the new regime with bringing guys off minor league contracts to the majors. Santana, meanwhile, goes on the Braves' major league roster, presumably in the same kind of play-everywhere role he had with the Twins. They have a similar kind of guy already in Emilio Bonifacio; Santana, I suspect, is better than him. The Twins swapped out another piece of the pitching staff over the weekend, dumping Michael Tonkin (designated for assignment) and restoring Justin Haley from the disabled list. As noted in the Monday print column, Tonkin had more than a year in the major league bullpen, a period of extreme disruption in that bullpen, and never managed to seize a role greater than mop-up/long relief. Remember: The Twins came north last year with Glen Perkins, Kevin Jepsen, Trevor May and Casey Fien as the four late inning arms. None made it through the full season with the Twins, and two two (Perkins and May) are on the 60-day DL and the other two are not on 40-man rosters. Brandon Kintzler, Ryan Pressley, Tayor Rogers -- they all took advantage of the opportunity created by the upheaval. Tonkin did not. The "up or out" system, used in a variety of endeavors, is effectively at practice here. The role Tonkin held for seven months or so is essentially an entry-level position. Nobody is expected to make a career at mopup work. A young pitcher gets called up and tested in it; he succeeds or fails; he moves into a more prominent role or departs. Haley is a Rule 5 selection, and the mopup/long-man role is basically designed for Rule 5 pitchers. Tonkin missed his opportunity. Now it belongs to Haley, and it will be up or out for him as well. 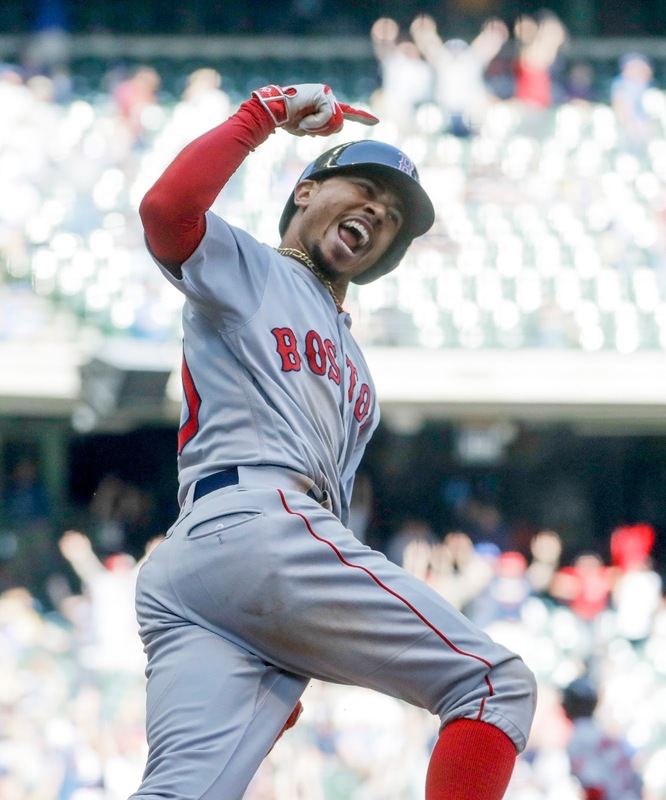 His ninth inning struggles Sunday (three hits and a walk in a third of an inning) didn't matter in the context of the game, which was already lost; they do matter in terms of building his resume to move into a more significant role. outfielder was subjected to racial slurs. So I won't spend my time or yours trying to recap it here. I just have one thought to share. After Jones made his complaint public, and other African American players chimed in with their stories, the ownership of the Red Sox met with their black players, who told them: Yeah, it happens to us here too. 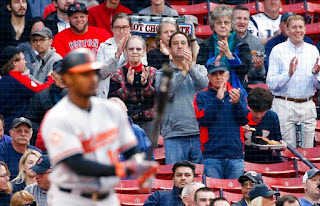 It seems to have taken the Red Sox management by surprise, this notion that their beloved Fenway Park harbors vocally racist fans. Presumably the owners are cocooned in their suites and well-removed from the trolls of the grandstands, bleachers and box seats. But as common as the slurs apparently are in the Fens, somebody in stadium ops had to know. At the very least the ushers knew. And at some level in the organization, somebody decided that this battle wasn't worth fighting. It might have been at the bottom of the pyramid, it might have been higher up the chain. After Monday's embarrassment, the Sox ownership is engaged with this issue, so the underlings will be expected to respond accordingly. And it appears that the message is being heard in other stadiums. You probably have heard that Joe Mauer hit a walk-off homer Friday night, his first such four-bagger in his illustrious career. I checked his career splits on Baseball Reference. It was his 14th ninth-inning homer. He sported coming into the game a .290/.377/.447 slash line in the ninth (a total of 520 plate appearances) with an OPS in the innings slightly below his career figure. It hasn't been a particuarly productive season so far for Mauer, although, as Mike Bernardino noted earlier in the week in an exhaustive examination, luck ran against him in April. He's hit a pair of homers this week; maybe things are turning around for him. The Twins made some roster moves earlier Friday. Replacing Kyle Gibson on the pitching staff is Drew Rucinski, a right-hander who has 14.1 major league innings on his resume, all with the Angels The Twins signed him as a minor-league free agent after he spent 2016 getting pounded with the Cubs' Triple A affiliate (5.92 ERA). He's been pitching most relief in Rochester. I don't expect much. They also activated Ehire Adrianza off the disabled list. And they DFA'd Danny Santana, a move that both opened a 40-man roster spot for Rucinski and an active roster spot for Adrianza. Santana's departure comes immediately after one of his better games; he homered and had a bunt single on Thursday. "What have you done for me lately?" apparently wasn't prominent in the front office's decision making. Adrianza played a handful of games in the outfield in Rochester, which was a sign the Twins were eyeing Santana's roster spot and limited role for him. Adrianza is by reputation a superior gloveman in the infield but a light hitter -- not that Santana, despite Thursday's long ball, is a particularly good batsman. Meanwhile, Bryon Buxton sat Friday with headaches after three collisions with the outfield fence drove him from the game on Thursday. The Twins report that he has otherwise cleared the concussion protocol, but we should remember that Buxton had a signficant concussion a few years ago in the minors. I suspect a trip to the concussion DL is in his future. And Brian Dozier twisted an ankle Friday. He stayed in the game but was pinch-hit for just before Mauer's homer. Upshot: there may be more roster moves ahead. Kyle Gibson had another rough start Thursday: Four innings, eight hits, four runs. His ERA rose to an unsightly 8.20. The bullpen gave up another four runs, but it was Gibson who took the loss and the fall, getting optioned out to Triple A Rochester after the game. I expect him back sooner or later; he's getting paid $2.9 million whether he's pitching in Minneapolis or Rochester. And the Twins are not exactly blessed with a surplus of starters. But the new regime isn't necessarily committed to Gibson. I wondered early in the offseason if he would be kept around. The answer was yes -- but with a leash shorter than I anticipated. Nick Tepsech, nominally the fifth starter, is now the fourth starter and he hasn't even appeared in a major league game this year. The Twins apparently won't need to add a starter -- assuming they're satisfied with Tepesch after he starts on Saturday -- for more than a week. Earlier this week I laid out a theory on why the front office is in no hurry to bring up Jose Berrios, and as far as I can tell that theory stands. The most likely next fifth starter, I suspect, will be the old fifth starter, Aldaberto Mejia. But things can change. The edict from Defense Secretary James Mattis means Jax will have to serve at least two years in the active Air Force (he'll be commissioned a second lieutenant upon graduation) before he can resume his baseball career. My take on the service academies is: The nation has a deal with these students. We the people provide a no-charge, high-level college education, and we get well-trained military officers. I object to the notion that they can/should be encouraged/allowed to walk away from that bargain three years in, with a heavy public investment in that bargain. The Twins, and Jax, may not be thrilled with this decision, but he's not the first academy grad to find himself in this situation. Roger Staubach (football) and David Robinson (basketball) each had to put in their two years with the Navy before launching their Hall-of-Fame careers in their respective sports. Jax is not the only athlete affected by Mattis' ruling. According to The Gazette (Colorado Springs), an Air Force receiver named Jalen Robinette was expected to be a fourth or fifth round pick in last week's NFL draft. Academy officials notified Robinette on Thursday that he would not be permitted to petition out of his active service requirement, and he was not drafted. One doesn't often hear that kind of talk from a player, even though getting released by one's first (and only) organization doubtless carries a unique sting. The Twins cut Plouffe loose early in the offseason, presumably having quickly ascertained that there was little trade interest in him, and it took him a while to find his one-year deal with the Athletics. While there remains plenty of time for him to turn his stat line around, he's probably not creating a lot of interest in his services in future seasons. Plouffe was typically handled in Minnesota as a cornerstone piece of the roster, locked the past few years into the cleanup or No 5 slots in the order. (In Oakland he's hitting eighth.) Part of the rationale behind trying to make Miguel Sano a right fielder was to accomodate Plouffe at third base. Plouffe was never, however, good enough in Minnesota to justify that status, and he hasn't been productive enough in Oakland to make the Twins wish they'd kept him. Jose Berrios named IL Pitcher of Week for 2nd time in 4 weeks and 3rd time overall. Season: 2-0, 1.09 in 5 starts. 33 IP, 35 K, 8 BB, 18 H.
The Twins current 25-man roster has just three starters: Ervin Santana, Kyle Gibson and Phil Hughes. Hector Santiago, who was expected back from his grandmother's funeral for a bullpen session on Monday, remains officially on the bereavement list; he figures to be activated for Wednesday's start, with (probably) Buddy Boshers returned to Triple A. That's four. The Twins will need a fifth starter on Saturday (unless they have another rainout before that). So Berrios, right? Well ,,, not necessarily. Early in the offseason, before pitching coach Neil Allen knew he would still be the pitching coach this year, Allen laid out a new protocol for side sessions. Every pitcher would open with three fastballs to one corner followed by three fastballs to the other corner. They have to hit those spots at least two of three times before proceeding to other pitches. And, Allen said, the ability to demonstate that command was going to be a factor in promotions. That stipulation caught my attention. It was part of why I figured all spring that Berrios was not prominent among their rotation options. It may be unfair to call this the Berrios Protocol -- fastball command was an issue for other pitchers as well in 2016 -- but it certainly provides a formal internal reason to overlook Berrios' dominance in the minors. Berrios is dominating Triple A. That's nice. The question is: How is he dominating Truple A? If he isn't locating his (rather straight) fastball to both side of the plate, he's not coming up. As discussed in the Monday print column, the two most likely candidates for the Twins to take with the first pick next month are two-way players. Hunter Greene and Brendan McKay are legitimate prospects both as pitchers and hitters. But when they enter pro ball, they will drop one. It may not be their idea or their choice -- indeed, both have reportedly indicated an interest in being two-way players in the pros -- but no organization is going to invest $7 million and such a premium draft pick in a player on the supposition that he can do both. It's both a health issue and a developmental one. Consider Greene, who plays shortstop for his high school team in the San Diego area when he is not on the mound. Teens with his extreme velocity -- he's been clocked at 102 mph this spring -- are rare, but they also come with high injury risk. Letting him pitch one day and play shortstop the next -- making throws off balance and from the hole -- only figures to add to the risk. McKay's injury risk is somewhat less than Greene's. He's older, he has less velocity, and his non-pitching position, first base, is the spot on the diamond that requires the least from the throwing arm. But the risk is there anyway, because pitchers get hurt, period. The other concern is developmental. Do not underestimate the amount of work even top prospects face in advancing their abilities to succeed in the majors. Again, the risk here is higher with the younger, less polished Greene, but it is genuine for McKay as well. Splitting their development between pitching and hitting may mean not succeeding at either. Casey Kelly was drafted in the first round of the 2008 draft by the Red Sox out of high school as a pitcher/shortstop. He split his first two years in the minors between pitching and short before dropping the position for the 2010 season. 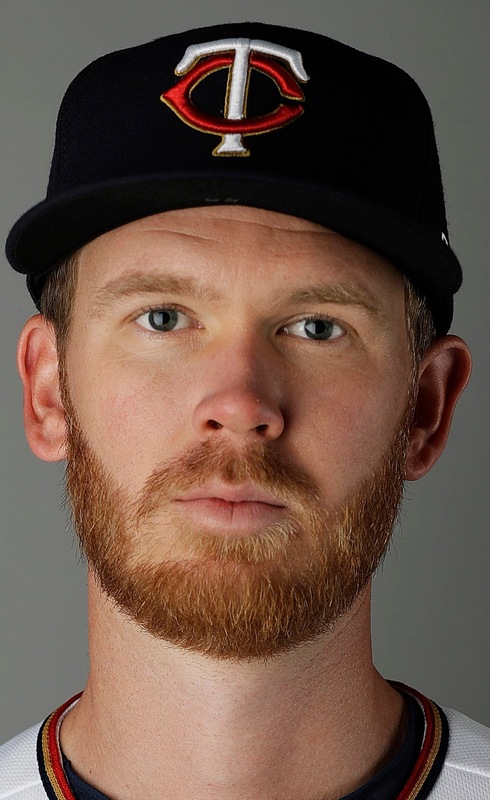 He's a pitcher now -- but at age 27 in his fourth organization (Boston, San Diego, Atlanta and now the Cubs), and while he has reached the majors he certainly hasn't succeeded. I can't prove that the indecision in his teens undermined him, but it probably didn't help. There are occasional two-way guys in the majors -- Christian Bethancourt made the Padres out of spring training this year as a pitcher/catcher but has since been sent down, and Brooks Kieschnick milked a couple of partial seasons in the majors as a reliever/pinch hitter a bit more than a decade ago -- but they are essentially fringe players. Teams certainly expect more than that out of players taken at the top of the draft.